There seems to be a potato hiding behind some very tasty looking Chips. He doesn't need to be there. The 'All Natural' also seems to be added randomly and almost invisibly. Apart from that this is a very good bag design. It adds historical perspective to Herr's as a company with the sepia image of some old countryside. It is flavor color coded. You are left in doubt about what style of Chip is inside this warm and inviting bag as it shouts its presence from the centre of the pack. There were some small sized Chips and a few broken ones in the bag, which brought into question the solidity and thickness, but they were fine. Nothing remarkable; very average in fact. The crunch was good, but not hard as found with some Kettle Chips. An average looking and feeling Kettle Cooked Chip. 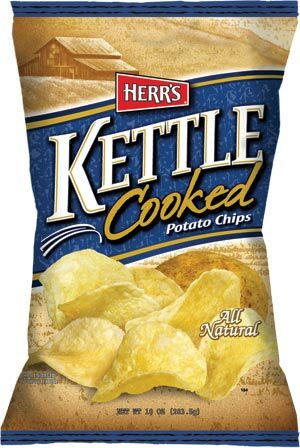 The thickness was that of a Kettle Chip, if a little thinner than the premium gourmet varieties. The oil bubbles created a rugged surface, rather than popping up on every Chip - although some of the larger ones had burst. There was skin on some Chip edges. There was more oil than seasoning visible.